Heat the oven to 400°F. Place the salmon into a medium bowl. Add the lemon juice and 2 tablespoons teriyaki sauce and toss to coat. Sprinkle the flour on the work surface. Unfold the pastry sheets on the work surface. Cut each pastry sheet into 16 (1/2-inch wide) strips, making 32 in all. Cut each strip in half crosswise, making 64 in all. Place 2 strips together to form a cross shape. Repeat with the remaining strips. Place 1 piece salmon in the center of each pastry cross. Fold the ends of the pastry cross over the filling and press to seal. Place the pastries seam-side down onto 2 baking sheets. Bake for 20 minutes or until the pastries are golden brown. Stir the marmalade and remaining teriyaki sauce in a small bowl. 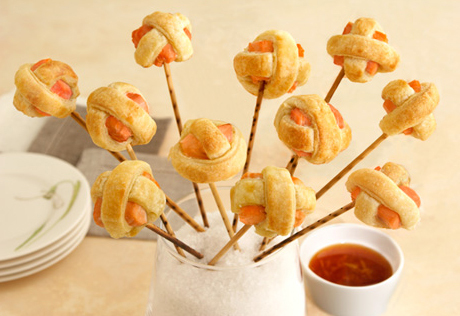 Serve the pastries on 3-inch wooden skewers with the marmalade mixture for dipping. For a fun serving idea, fill a small vase with salt. Stand the ends of the skewers in the salt to make an edible arrangement. Another attractive serving idea is to cut oranges or lemons in half and place them cut-side down onto a platter. Stick several lollipuff skewers into each half.